Nicolas Rathe is a pointsman, a dedicated watchman in the great city of Astreiant. During the annual trade fair, with a city filled with travelers and merchants, someone is stealing children. The populace is getting angry and frightened and convinced that a foreigner must be to blame. Rathe calls on the aid of both an out-of-work soldier, the handsome Philip Eslingen, and the necromancer Istre b'Estorr. The art of astrology is a very real power in the kingdom and plays as much a role in politics as greed and intrigue. Rathe finds himself struggling to find the children before a major astrological event brings about catastrophe. 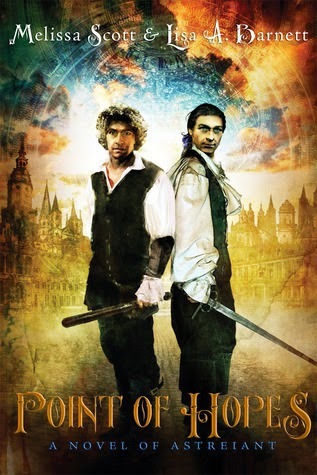 The first in a series of fantasy novels filled with adventure, intrigue and gay romance. What I loved about this book was that everyone was bisexual, but in a very subtle way, and I thought this was brilliant. Melissa Scott has always been a writer I admire as I devoured her book Death by Silver and A Death at the Dionysus Club. And Point Of Hopes is very much like these two books in its mystery and writing style. In a lesser writer the book may have been seen as dull and slow, however Scott and Barnett somehow drag you in and keep you hooked with the brilliant world they have created, and their brilliant charismatic characters. The Kingdom of Chenedolle is much like Renaissance London in my mind, as the world is ruled by a childless queen, whose time on the throne is coming to an end and she must choice an heir. To me this sounds a lot like Queen Elizabeth the first, who was also unmarried and childless. This world Scott has created is fascinating and packed with detail so that nothing seems different from our world, although you are reading High Fantasy. The world is easy to follow and keep up with the laws of the universe. Chenedolle is under two suns the true sun and the winter sun, and is a place where astrological predictions govern nearly every aspect of everyday life.